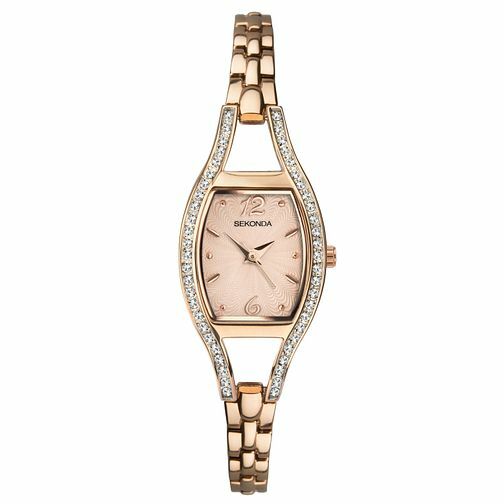 A trendy tonneau shape ladies' watch by Sekonda is crafted in a stunning and chic rose gold tone. The attractive rose tone dial is complimented with rose gold tone hour markings, featuring the 12 and 6 numerals, dash indices and round studs. A sparkling crystal stone set case brings this design to life, sure to shimmer whenever the light catches. This delightful ladies' watch, is complete with a thin rose gold plated bracelet, minimalistic and marvellous, the perfect stylish finishing touch to your look.